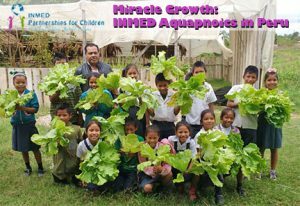 School children are busily harvesting the bountiful crops from their INMED aquaponics system at an elementary school in Yarinacocha, a village in the Amazon jungle outside of Pucallpa, Peru. Produce and fish are being cultivated in a system INMED established last year as part of a Gates Foundation grant to improve nutrition and health of indigenous children. Not only does the system provide access to fresh foods, which are incorporated into school lunches, but has proven to be a great hands-on teaching tool for teaching the children about nutrition, health and sanitation, climate change and alternative farming methods, as well as other subjects such as biology and math. ← Opportunity Center Students Are Ready to Grow!